If you choose to set or display letter grades in eClass, it is important to review the default grade boundaries to ensure that the system assigns the appropriate letter grade for each range of marks that you assign. Letter grades are also the required output format for grade exports to Bear Tracks and you are required to review the letter grade boundaries before completing that task. 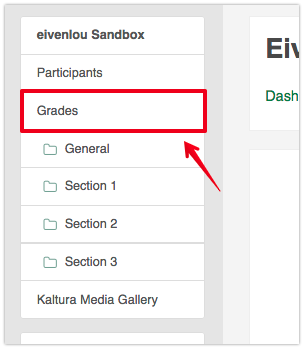 Go to the Grade administration page by clicking on Grades in the navigation panel, near the top left corner of the page. 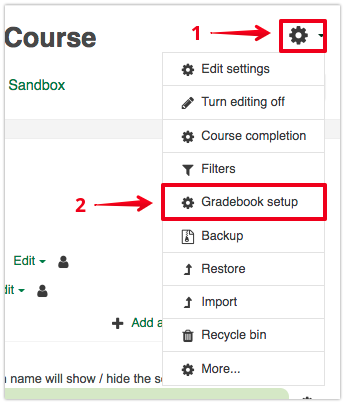 Alternatively, to access the Grade administration page, you can also click on the gear icon on your course main page, then select Gradebook setup. Once you are on the Grade administration page, make sure you are in the View tab, under the Letters tab. 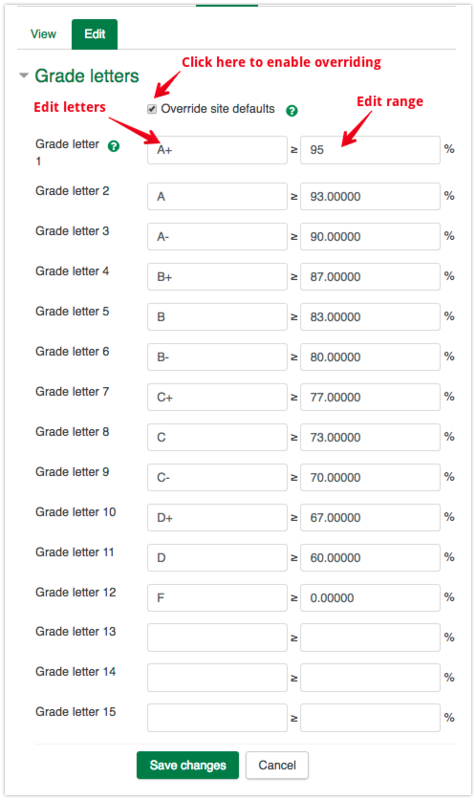 This will display the numerical percentage range for each letter grade. Please note that these are the default letter grade boundaries provided by the University registrar and may not be appropriate for specific Faculties or Departments. 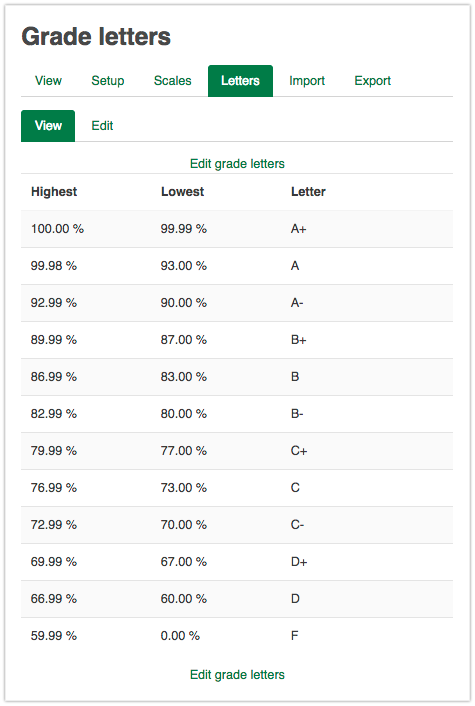 On the letter grade distribution screen, click on Edit grade letters to change the range for each letter or click on the Edit tab. You first need to check 'Override site defaults' to enable editing, then you can change the letter titles and range values as required. Be sure to click Save Changes to confirm the new boundaries. Once your letter grade boundaries are set, they can be used to display letter grades for the marks you provide to students, either on individual grade items or for the entire course total. Please consult the article - Formatting Student Grade Display for instructions on the options for displaying letters to students. Note: this is not the same as assigning letter grades for specific learning activities - you can do this but you should consult the following article which explains the mechanics: Using the Improved Letter Grade Scale. If you are more comfortable with maintaining a separate spreadsheet in Excel or elsewhere that calculates student letter grades for you and only wish to upload a column into the eClass gradebook to display it to students, please consult the article: Importing Text Columns into the Gradebook.